My board is Zybo Z7 20 + Pcam... I already did it all like forum solution. Plz let me know how to solve it. I did it below steps. 1. Download the latest version of the Pcam 5C Demo project from https://github.com/Digilent/Zybo-Z7-20-pcam-5c, in zip format. 2. Use the vivado library zip file (which includes the D-PHY and CSI-2 IPs) you previously downloaded from https://github.com/Digilent/vivado-library/tree/feature/d-phy, or download it again. 3. Unzip the two zip files, put the vivado library in its folder under the repo folder. 4. 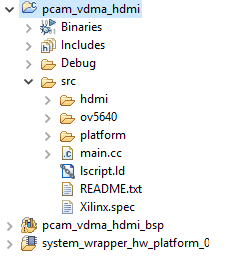 Run the create_project.tcl script from Vivado 2018.3. 5. In ﻿the project block diagram, double-click on the MIPI_CSI_2_RX_0 IP and deselect Debug Module. Press OK. Save the project. 6. HDL Wapper -> Generate Birsteam. 86 Infos, 123 Warnings, 0 Critical Warnings and 8 Errors encountered. Thank you for the response. @Ciprian is out of the office for the holidays. It will be a little bit of time before there will be a response. Is @Ciprian back in the office 😃 ? When would you expect the demo to be fixed for version 2018.3 ? I have reached out to @Ciprian as this thread has appeared to slipped through the cracks. We typically try to upgrade most of our project on the xxxx.4 version of Vivado. I am currently unaware when/if the Zybo-Z7-PCAM-5C project will be updated. 3. It says that the platform has not been initialized. Everything happens as soon as importing the file systems in the sdk after creating the Application Project. Note also creating two application projects creates the crush of the program.